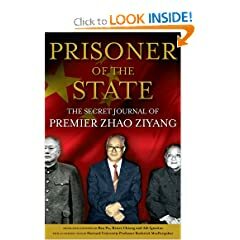 On the occasion of the twentieth anniversary of Tiananmen Massacre, the book Prisoner of the State, the Secret Journal of Premier Zhao Ziyang was published with great fanfare. There have been many instant reviews in the mainstream media hailing for the importance of the book, especially that it tells the "real story of Tiananmen." According to the book's publishers and editors, Zhao Ziyang had spent parts of his last years recording his thoughts in secret. The audio tapes were only discovered after his death. He left no words on the purpose and intention of these tapes. Bao Pu, the son of Zhao Ziyang's long-time political assistant Bao Tong, led the efforts in transcript the tapes and make them into this book, published separately in Chinese and English versions. Bao Pu has since refused to make the tapes themselves available to the public, other than a few excerpts. So there are no independent means to assess the authenticity of the book material. As memoirs of Chinese leaders are usually non-existent, it is also almost impossible to cross-examine the content against other similar books. Did he actually agree and approve the infamous April 26 People's Daily editorial before its publication while he was away in North Korea? During the critical period in early May when he was personally in charge and conducting dialogues with the public to defuse the tension, why did he not make any such efforts to reach out to the protesting students before the hunger strike? After the hunger strike, did he direct and/or authorize Yan Mingfu's dialogue with student leaders? What was the strategy for that dialogue? Why did he disclose the "state secret" that Deng Xiaoping was still the supreme leader in China during his meeting with Soviet leader Mikhail Gorbachev? Actually, the 306 pages long book only has its first part, merely 49 pages, dealing with the 1989 student movement. That certainly could not, and did not, do justice to the greatest event which would dominate Zhao Ziyang's historical legacy. That short passage read in a very defensive, and indeed self-pity, tone. Zhao Ziyang tried to blame a conspiracy, led by then Premier Li Peng and supported by Deng Xiaoping, which undermined his strategy and led to the martial law and the eventual massacre. But it was unclear what his strategy or leadership was. Being the General Secretary at the time, the book showed a leader who was lost, soft, and lack of ideas or willingness to take any meaningful action on his own. Zhao Ziyang did confirm that he had approved the publication of the editorial. He attempted to explain that he could not have done anything else because he was away and did not know all the facts. Zhao Ziyang blamed Li Peng and other leaders not to contact student leaders. There was no words explaining why he did not try to do it himself. The book did not mention Yan Mingfu's dialogue attempts at all. It was as if that important facets of the movement had never happened. The book did dedicate a whole short chapter to the Gorbachev meeting. He tried to downplay its significance. But the rationale presented there sounded contrived and weak. It also contradicted to Bao Tong's own testimony that Bao Tong had intentionally inserted the statements at last minutes. As far as the Tiananmen is concerned, this is a rather uninformative book. It is not surprising since the "real story" of that magnificent movement did not happen within the walls of the government compound. It happened on the campuses, on the streets, and in Tiananmen Square. That is a story that Zhao Ziyang, or any other government leaders at the time, is unable and unwilling to tell. This is the worst and insulting review I have ever seen on this wonderful book. I agree with the above comment: the reviewer is an egotistic XXXXX.